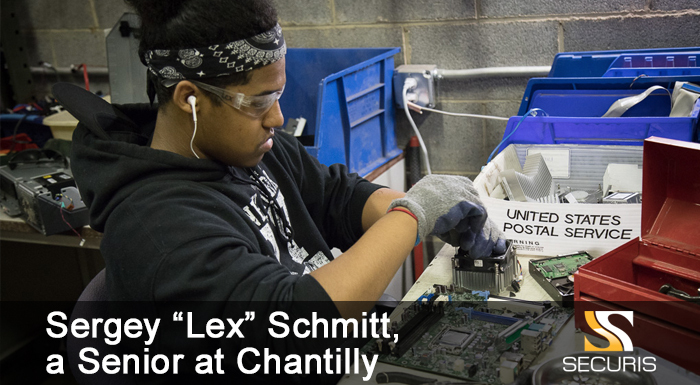 When Sergey “Lex” Schmitt, a senior at Chantilly High School, graduates in June he will transition to the area Davis Career Center to pursue vocational and life skills training, but he already has a leg up on his competition due to a special work training program he has been participating in for the past year. Lex started his first work-based learning experience at Securis, Inc., a local provider of green alternatives for electronic recycling, hard drive shredding and data destruction. For more than ten years, special needs students at Chantilly High School, in Fairfax County, Virginia have gained valuable real-world experience as part- and full-time employees. Securis, headquartered in Chantilly, holds three different classes, training up to 12-14 students each day, though the county’s Career Preparation Class and Education for Employment for Special Education. “It was hard at first because I did not know how to use the tools,” says Schmidt. “I learned how to take apart computers and became good at it. I like the people who helped me learn this trade. His parents said that he gained confidence working at Securis, and they thank the Chantilly High School teachers and the staff at Securis for giving their son the opportunity. company Founder and President Jeremy Farber. One student worked for the company for five years before moving out of state as a full-time onsite supervisor, teaching students with disabilities how to disassemble electronics and follow our safety guidelines, while serving as a mentor and role model for the students. The company has recently initiated a partnership with the high school to create more opportunities for students with disabilities who are transitioning from high school, such as paid internship opportunities with the intent of hiring students for part-time summer employment.